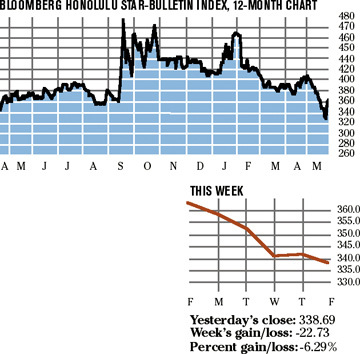 Hawaiian Electric Industries Inc. was the top-performing stock in the Bloomberg Honolulu Star-Bulletin stock index this week, up nearly 3 percent to close at $27.25 in a week that saw the index lose more than 6 percent. HEI is up about 4 percent in the year to date and for the last 12 months. 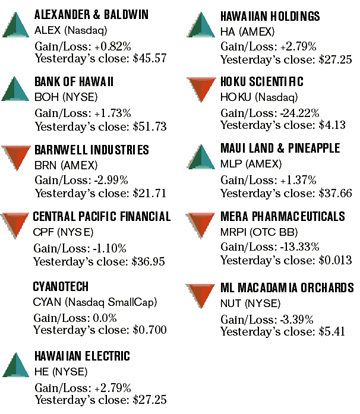 The biggest loser for the week was Hoku Scientific Inc., down more than 24 percent to close at $4.13. The company, founded to make components for hydrogen fuel cells, announced after the close of trading Tuesday a $250 million plan to branch into production of solar-electric panels. Most of its loss for the week occurred in the next day.